The obvious question is, with consumer demand relatively weak, what motivated all that investment? And the answer, to an important extent, is that it depended on an ever-inflating real estate bubble. He forgot to check real wages. 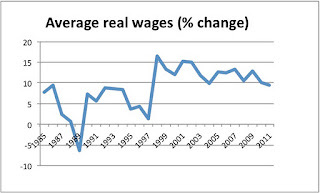 The graph below shows that, in contrast to the US, Chinese wages have expanded incredibly fast. 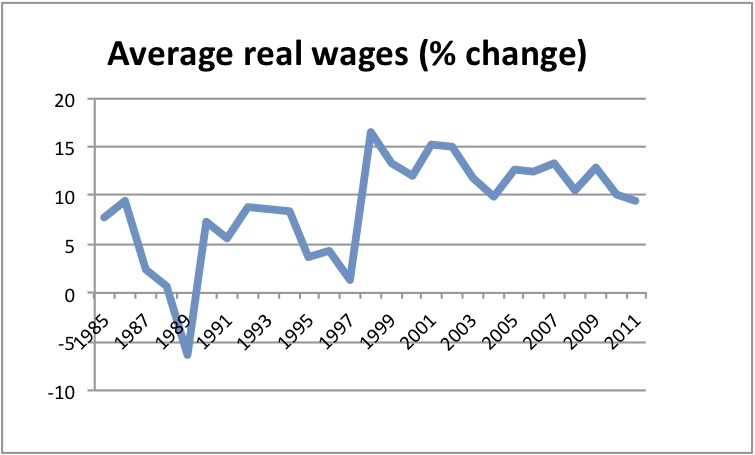 Since the Asian crisis, real wages have grown at more than 10% per year. Consumption as a share of GDP remains low simply because a lot of investment is State driven and exogenous, and incredibly large. Even if there is a real state estate bubble, growth is led by government spending and by rising real wages. And by the way, there is no significant foreign debt, so a collapse of a bubble could be handled by domestic authorities without a sweat. Krugman is just wrong on this one. PS: Data is from the Economics Intelligence Unit (subscription required). Check also ILO's Global Wage Report. "Real state" or "real estate"? Or an intentional "slip"? In any case, completely agree, the doomsayers are quite wrong. There is a great deal of ruin in a nation, but the Chinese, unlike the Americans & even more, the Europeans are not presently interested in experimentally figuring out how much.